Caught off guard, surprised by their own reactions, emotions bubble up that women fight to smother. Where did that come from? What can I do with this feeling that won't go away? Why do I feel and act this way? Counselor Marilyn Meberg has been there too. When she got pregnant, she got scared. When her baby girl died, she got angry. When her husband died, she battled loneliness and sorrow. In between the peaks and valleys, Marilyn began to see a pattern that led to a greater understanding of herself and a richer happiness in life. She says, "We crave connection with the ones we love most, and when our bond with them is broken, damaged, or threatened, we fear being left. We fear abandonment." 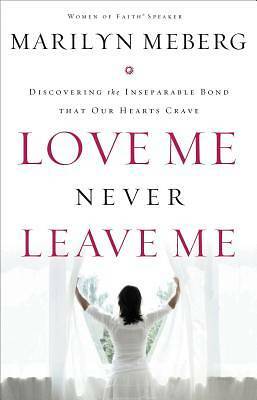 Love Me, Never Leave Me tells you that desiring a love that never leaves is natural, that there are ways to turn feelings of being abandoned into experiences of emotional abundance, and to know that you are God's beloved child--and he will never leave you or forsake you.